Tags: Black, Kameez, Semi Formal, Straight Trouser, White. Top: Black katan silk shirt having off white embellished of thread on bodice. 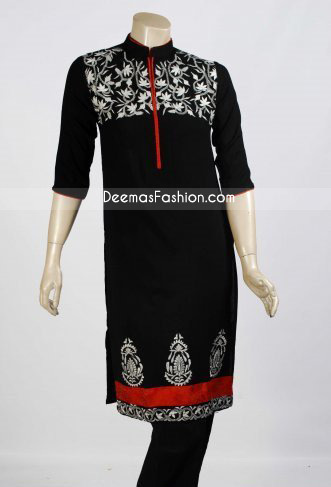 Antique embellishments made on hemline with small sized ornamental motifs. Chines neckline. Concealed zip closure on back. Finished with Red piping on edges.